The mid-term review of the Tenth Plan, which is being given the final touches by the Planning Commission, has made out a case for closure of sick central public sector enterprises and reduction of industrial subsidies as measures for imparting dynamism to the industrial sector. Haryana is emerging as a major electronics and software exporter in the country with its exports crossing the Rs 5,000-crore mark in 2003-04. It is now neck-to-neck with states like Delhi and Andhra Pradesh and stands sixth in the country in IT exports. Networking major Nortel's vice-chairman and chief executive officer William Bill Owens, who is hailed as one of the 50 most powerful businessmen in the world, is in India to share his vision on the growth strategy prospectus chalked for the company. Q. I have 1 acre of ancestral agricultural land at our village in Haryana, which is 15 km away from Thanesar (Kurukshetra). It was in the name of my father (who expired in 1991). The land was purchased by my father in 1957. The mid-term review (MTR) of the Tenth Plan, which is being given the final touches by the Planning Commission, has made out a case for closure of sick central public sector enterprises (CPSEs) and reduction of industrial subsidies as measures for imparting dynamism to the industrial sector. The review also makes out a case for discontinuing the retention price scheme(RPS) for urea and suggests that the pricing of items like natural gas must eventually be done on the basis of the international parity price. The MTR has also undertaken a comprehensive review of industrial performance during the first three years of the Tenth Plan (2002-07). The mid-term review is slated for Cabinet approval and will eventually be cleared by the National Development Council (NDC). The appraisal says continuation of the retention price scheme(RPS) for urea defies economic logic. It notes that the RPS is sought to be justified on the specious plea that it supports food security. Regarding the pricing of items like natural gas, the review suggests that this should be done on the basis of the international parity price as was envisaged in the Tenth Plan document. It says the need for moderation of subsidy practices in industry arises from fiscal constraints. Giving up the RPS in urea and closure and sale of unrevivable sick CPSEs will contribute substantially to the reduction of the fiscal deficit, which is a threat to the macroeconomic stability of the economy. It regrets that the performance of the industrial sector in the first two years of the Plan(2002-07), for which data is available, has been below expectations. Industrial growth averaged only 6.6 per cent which is much below the target of 10 per cent. The performance in the third year, although still below the target, is expected to be much better. The share of manufacturing in the GDP continues to stagnate in the range of 17 per cent. Growth rate of value addition in the registered manufacturing sector has been in recent years higher than in the unregistered manufacturing sector. Registered manufacturing units contribute about 65 per cent of manufacturing gross value added, while unregistered ones account for 35 per cent of this parameter. A report on state-wise electronics and computer software exports for 2003-04 shows that Haryana exported IT goods worth Rs 5,143 crore in the year, almost 44 per cent more than in 2002-03. The total value of IT products exported from the country during the current year was Rs 65,700.78 crore, an increase of about 26 per cent from Rs 52,100 crore. UP logged exports worth Rs 4,226 crore , Punjab ( Rs 190.75 crore) and Himachal Pradesh(Rs 11 crore) in software and IT-enabled services in 2003-04. The total exports in 2003-04 in Haryana was almost 10 per cent of the total national software exports of the country. Gurgaon ,with its proximity to the Capital, besides being a major call-centre hub, has been a major contributor to the state’s software exports, next only to cities like Bangalore and Chennai. Several big companies have set shop here with huge investments. The visit of William Bill Owens, who landed in New Delhi this morning, will also enable it to compete with emerging companies in the ASEAN region, sources said. He is slated to meet top bureaucrats, ministers and business leaders in the Capital on May 16 and 17. Young Ravi was very good with her hands while at school in Nagpur. Her embroidery was very neat and her other craft was put on permanent display after she passed out from school. This skill lay dormant as she did her graduation and came as a bride to Chandigarh, married to businessman M.M.S. Chawla. For some years it was just making home and raising children but once children were eight and ten, Ravi Chawla had enough time to pursue her interests. “I joined an interior decoration course so as to be able to redecorate my own house. I had no plans to be an entrepreneur but things were destined to be so,” says Ms Chawla. Ravi set about redecorating her own bedroom. There was a vacant corner and she decided to put a pot there. “I bought a readymade pot and started working on it. I knew very little about paints but since my husband had a Maruti repair workshop, I asked him to give me some paint and at one spot I made motifs with M. seal which is used in filling dents on car bodies ” says Ravi. The pot came out unusually beautiful and a visitor to her brother-in-law’s house on the first floor told her: after seeing the pot “Make a few more and I will hold an exhibition of these pots.” The exhibition held at Shivalikview Hotel was a complete sell-out. Ravi was encouraged and so she decided to pursue another art that fascinated her much. “I had always liked the stained glass church windows of western art and yearned to learn the art. But I had no idea where to go and who to learn it from. Finally I came to know that there was someone in Mumbai teaching the art. I went there and did a two-week intensive course. Back in Chandigarh she started a little studio in her home for decorating potery as well as making stained glass. Her skills improved with time and soon she was getting orders from many places. At this point her husband felt that his better half was earning more than him. “I had no ego it and instead of resenting, it, I decided to close down the workshop and join her in marketing the artefacts,” he says. Ravi adds that if it weren’t for his aggressive marketing, she may not have made it so big. It certainly is big with a whole factory in the Industrial Area and 40 skilled artists and craftpersons working overtime to meet the huge demand for Ravikriti, as the venture is named. Not only does every embassy in the country boast of her artefacts, she is exporting those to the USA, the UK, Australia and even China, which is the home of pottery. Her creations are displayed in Rashtrapati Bhavan and also find place in popular television soaps like ‘Kyunki Saas Bhi Kabhi Bahu Thhi’ and ‘Kahin To Hoga’. A mother of two, Ravi Chawla’s younger son and daughter-in-law have joined the business. Ravi’s stained glass panels have many takers in spite of stiff competition. “My greatest joy in the 14-year-long art entrepreneurship was making a stained glass mural on Sikh history. I made a four-panel mural on an episode from Guru Tegh Bahadur’s life,” she says. 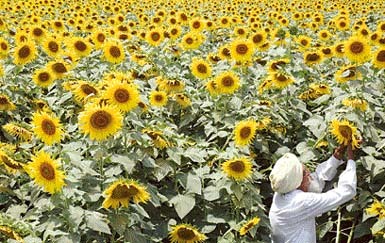 Q. I have 1 acre of ancestral agricultural land at our village in Haryana, which is 15 km away from Thanesar (Kurukshetra). It was in the name of my father (who expired in 1991). The land was purchased by my father in 1957. I will be selling it for Rs 6.25 lakh. I am a pensioner and income tax payee. I want to know the status of money so received by me. Whether this will be exempted from tax being an agricultural land or will it carry tax obligation. What are the tax obligations and what are the way out to minimise the tax if any. A. The agricultural land owned by you in a village in Haryana will get covered in the definition of the words “Capital Assets” if the same is situated within a distance of 5 km from the Municipal Committee/Corporation of Thanesar in all directions. The distance as specified above has been laid down by the Notification No. SO 10(E), dated 6-1-1994, as amended by Notification No. SO 1302, dated December 28, 1999. In case the land so situated is not covered within the specified distance, any capital gain on the sale thereof would not be chargeable to tax. However, in case the land is so covered within the definition of the words “Capital Asset”, the capital gain will have to be computed by taking the market value of the land as on 01.04.1981 which will be indexed in accordance with the Cost Inflation Index notified by the government. The Cost Inflation Index notified for the financial year 2004-05 is 480. You have also stated in your question that the land was purchased by your father. Since you have inherited the land after your father’s demise, the tax will have to be paid by you. You have the option to invest the capital gain in the acquisition or construction of a residential house within the specified period. You can also invest the amount of capital gain in capital gain tax saving bonds. These bonds have to be bought within six months from the date of transfer of land. Q. I opened my NSS account on February 9, 1989 by depositing Rs 6,000 only. Later on I deposited Rs 38,000 up to December 10, 1990 in piece meals. No further money was deposited. This amount grew up to Rs 1,87,259 by March 31, 2004 by way of interest accrued. My first withdrawal is to the tune of Rs 30,000 on March 2, 2005. Interest accrued during 2003-04 was Rs 13,065. My query is can I claim deduction of Rs 12,000 from my income under Section 80-L? A. Any amount withdrawn out of National Saving Scheme account is taxable in the year in which the amount is withdrawn. There is no exemption in respect of interest earned in such account. No deduction is allowable under section 80-L of the Income Tax Act, 1961 in respect of the interest earned in such account. Q. In 1958 I purchased a plot for Rs 3,000 in a rural area (now within the outer limits of a Municipal Corporation of Haryana). I am now being offered Rs 9 lakh out of which I shall have to pay Rs 1 lakh for development charges, though the area is partially developed. 1. Could you kindly help me to know the capital gain and how much I shall have to pay by way of tax on capital gain? 2. Can I make use of the sale proceeds on the construction of upper storey on my house in Chandigarh? A. In accordance with the provisions of Section 48 of the Act, cost of capital asset which was acquired before April 1, 1981 can be substituted by the market value of such an asset as existing on April 1, 1980. For the purposes of computation of “Capital Gain” this becomes the cost of the capital asset, which has to be further increased by the Cost Inflation Index, which is notified by the government for every year. The Cost Inflation Index for the year 2004-05 is 480. You may kindly get the value of your plot as on April 1, 1981 ascertained with the help of an approved valuer and a certificate should be obtained for the purposes of establishing such market value. The said market value may be multiplied with the aforesaid Cost Inflation Index and divided by 100 so as to arrive at the amount deductible from the sale proceeds. The balance would represent capital gains. A tax at the rate of 20 pc + surcharge @ 10 pc and education cess @ 2% will be levied on the amount of capital gains so earned. The capital gain earned on the sale of plot can be utilised for the construction of a new residential house. The construction must be completed within a period of 3 years from the date of transfer of the plot. To avail exemptions the new house so built must be an independent house capable of being used as residential house independent of the existing ground floor. Q. I retired from Central Government service at the age of 60 on December 31, 2004 and my department deducted the full tax of Rs 26,682, as applicable in my case, on total drawn salary of Rs 2,68,181 till December 31, 2004. 2. From January 2005, I became a senior citizen and have now received pension of Rs 17,500 within the current financial year. 3. Please let me know the tax liability in my case, keeping in mind senior citizenship status w.e.f. January 1, 2005. A. A sum of Rs 25,961 (excluding interest U/s 234B, if any) will be payable as tax on the income to Rs 2,85,681 earned by you during the year. The above figure of tax has been arrived at on the basis of figures given in your question. In case there is any other income chargeable to tax which is not indicated in the question, the tax payable may have to be modified on the basis of such additional income. Senior Citizen Rebate of Rs 20,000 from tax U/s 88-B of the Act is available only after attaining the age of 65 years. Since you have attained the age of 60 years as on January 1, 2005 the aforesaid rebate is not available to you.